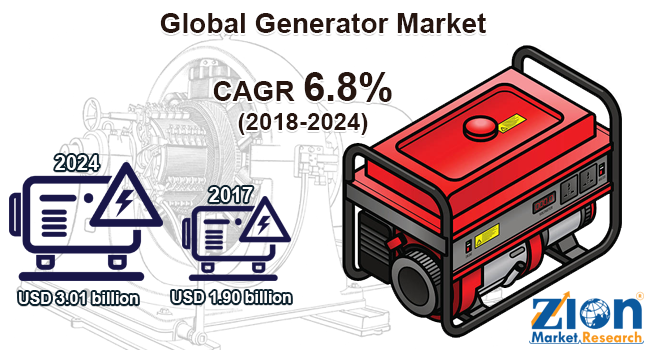 Global generator market expected to generate revenue of around USD 3.01 billion by end of 2024, growing at a CAGR of around 6.8% between 2018 and 2024. A generator is also known as a dynamo, several machines convert kinetic or mechanical energy to electricity for distribution and transmission beyond power lines to commercial, domestic, and industrial customers. The report covers forecast and analysis for the generator market on a global and regional level and country level. The study provides historical data from 2015 to 2017 along with a forecast from 2018 to 2024 based on both volume (Units) and revenue (USD billion). The study includes drivers and restraints for the generator market along with the impact they have on the demand over the forecast period. Additionally, the report includes the study of opportunities available in the generator market on a global level. In order to give the users of this report a comprehensive view of the generator, we have included a detailed competitive scenario and product portfolio of key vendors. To understand the competitive landscape in the market, an analysis of Porter’s Five Forces model for the generator market has also been included. The study encompasses a market attractiveness analysis, wherein product segments are benchmarked based on their market size, growth rate, and general attractiveness. The study provides a decisive view of the generator market by segmenting the market based on fuel type, power rating, generator type, end-user, and regions. All the segments have been analyzed based on present and the future trends and the market is estimated from 2018 to 2024. Key fuel type segments covered under this study include gasoline, diesel, LPG, natural gas, and others. On the basis of power rating the market has been segmented into up to 5 KVA, 5 to 10 KVA, 10 to 15 KVA, and 15 to 20 KVA. On the basis of end-user, the market has been segmented into industrial, telecom, residential, and commercial. The regional segmentation includes the current and forecast demand for North America, Europe, Asia Pacific, Latin America, and the Middle East and Africa. Each region has been further segmented into countries such as the U.S., Canada, Mexico, UK, France, Germany, Sweden, Italy, China, India, Japan, South Korea, Southeast Asia, Brazil, Argentina, GCC Countries, South Africa, and others. This segmentation includes demand for the generator based on product and end-user in all the regions and countries. The report covers a detailed competitive outlook including the market share and company profiles of the key participants operating in the global market. Some of the major players involved in the global generator include Cummins Inc., Kohler Co., Mahindra Powerol, Caterpillar Inc., Yamaha Motor Corporation, Honda Siel Power Products Ltd., KOEL Green, Generac Holdings, Rolls-Royce, Yanmar, and others.